Sundance. Stunning is just one word that describes this collection. Notice the button tufted arm detail with gentle curved framing.Nail head trim flows throughout this piece. Seats and back pillows are removable and velcroed together to keep from slipping around. Numerous matching pieces are available including loveseat, chair, ottoman, recliner and sectional. Custom sizes available, see sales associate for details. Kiln dried appalachian hardwood, Real Eight way hand tied spring suspension, Double doweled frames, Corner block joinery, steel band reinforced.Spring-Down Cushions standard. A third foot can be added to front rail on sofa for a small upcharge. Framing:Appalachian solid hardwoods, all joints corner blocked, dowelled & glued and screwed for uniformity & strength. No plywood, No Particle Board. Seat Deck Support: Time Tested True-8 way hand tied suspension supported underneath with "L" locked steel bands vertically and horizontally attached at bottom of framing for superior ride,comfort and durability. Seat Cushions: Spring Feather/Down high resilience seat foam standard for superior durability,comfort and longevity. Optional Lux down or Lux Crown seats. Back Cushions:Poly Blend Back cushions standard. All cushions are individually bagged, zippered, and channelled to prevent bunching of fill. Optional Down feather back pillows. Entirely built in the USA. Custom Sizes are available on any item, depth, height, length. Lifetime Limited warranty on frame and spring system against failure or breakage under normal residential use. • 2 Year Limited warranty for failure of mechanical parts including mechanisms and Cushion Cores. • 1 Year Limited warranty against cracking,seam slippage,splitting of leather. •Warranty does not cover labor, or delivery/pickup or other fees associated with repair after 1 year. Dimensions are approximate and can vary 2" on hand made products. We did a lot of shopping before we came across this beautiful sectional on Leather Shoppes.... nothing else compared to the American Heritage quality and looks. It is such a fantastic addition to our home. Can't wait for the whole family to see it for the holidays!! Warranty: Reclining Mechanisms And Springs: American Heritage warrants to you, the original retail purchaser, protection against defective materials or workmanship for a period of five (5) years from the original date of purchase based on reasonable use. American Heritage will, at its discretion, repair or replace the part of the mechanism that is defective. After the first year of use, the mechanism warranty covers replacement parts only and does not cover any associated labor shipping costs. Frame Parts: American Heritage warrants to you, the original retail purchaser, protection against materials or workmanship for the useful life of the product as long as it remains upholstered in the original covering and is used under normal conditions. American Heritage will, at its discretion, repair or replace the part that is defective. After the first year of use, the frame warranty covers replacement parts only and does not cover any associated labor or shipping costs. Filling Materials: American Heritage warrants to you, the original retail, purchaser, protection against defective materials or workmanship of the inside back filler, padding and other filling materials for a period of one (1) year from the date of original retail purchase. Compression of filling materials with us is normal and should not be considered loss of resiliency. 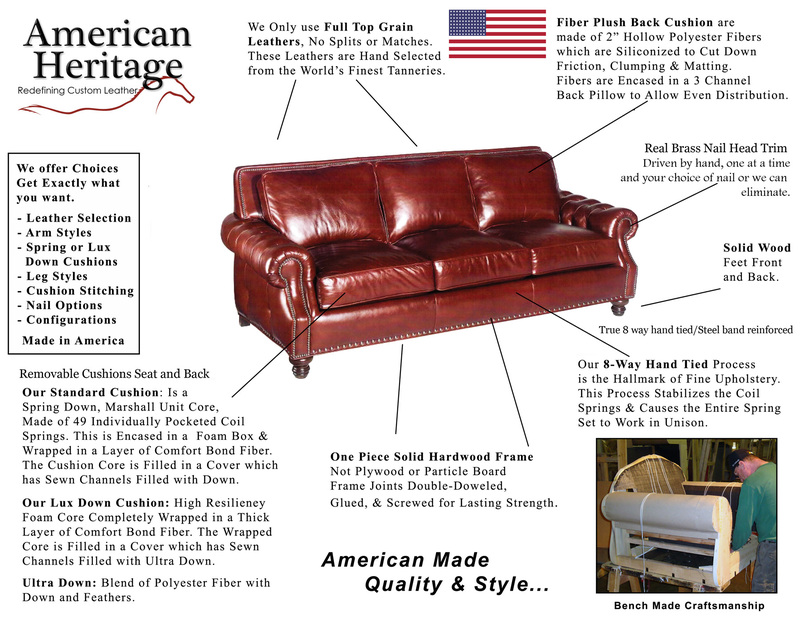 Cushion Cores: American Heritage warrants to you, the original retail purchaser, protection against abnormal loss of resiliency for the useful life of the product, as long as it remains upholstered in the original covering and is used under normal conditions. Some softening and flattening of the foam core and fiber/ feather wraps should be expected and will not be considered defective. After the first year of use, the cushion core warranty covers replacement cores only, and does not cover any associated labor or shipping costs. Power Recline: American Heritage warrants to you, the original retail purchaser, protection against a defective power recliner mechanism for a period of (3) years from the date of original retail purchase. American Heritage will, at its discretion, repair or replace the part of the mechanism that is defective. After the first year of use, the mechanism warranty only covers replacement parts and does not cover any associated labor or shipping costs. Please understand that American Heritage will charge you for the new parts but will be glad to credit you for the old parts if returned within 30 days. Battery Pack (power Recliner Option): American Heritage warrants to you, the original retail purchaser, protection against a defective battery pack associated with the power recliner option for a period of one (1) year from the original date of purchase. The mechanism warranty only covers replacement parts and does not cover any associated labor or shipping costs. Battery packs recharge in 8 hours, have approximately 200 full cycles per charge with approximately 400 recharge cycles, These can retro-fit to past motors and control boxes (cable needed). Claims: To make a claim under this Warranty, contact the store from whom the product was purchased with your dated proof of purchase. If the store finds return to the factory to be necessary, repair or replacement of defective parts will be made through the store during the first year at no cost to the customer, except for the cost of packing and shipping to and from the factory. After the first year of purchase the above warranty covers REPLACEMENT PARTS ONLY and does not cover labor or shipping costs of parts. After the first three years, the mechanism must be returned to American Heritage in order to take advantage of the warranty. Warranty Limitations: This warranty does NOT include: •	The wearing quality, durability, and color fastness of FABRICS OR LEATHERS •	Any condition resulting from incorrect or inadequate maintenance, cleaning or care. •	Any condition resulting from other than ordinary residential wear, or from any use for which the product was not designed. •	American Heritage is NOT responsible for fading or discoloration of leather due to sunlight (direct or indirect) or body oils. •	American Heritage Is NOT responsible for pickup and delivery charges for local repairs or inspections under the above warranty. •	Any condition resulting from the use of an aftermarket cleaning/ conditioning product. American Heritage obligation under this Warranty is limited to repair or replacement in accordance with the terms of this warranty. There are no warranties, either expressed or implied, offered by American Heritage other than those herein described. Coverage under this Warranty does not include incidental or consequential damages other than the coverage described above. Some states do not allow limitation on how long an implied warranty lasts or the exclusion or limitation of incidental or consequential damages, so the above limitations or exclusions may not apply to you. This warranty gives you specific legal rights, and you may also have other rights, which vary from state to state.